A befitting finishing touch to a beautiful ceremony, our Orders of Service are crafted by an award-winning design team and printed to the very highest standards. They provide funeral attendees with a valued keepsake to take away and cherish as a memento of their friend, colleague or loved one. 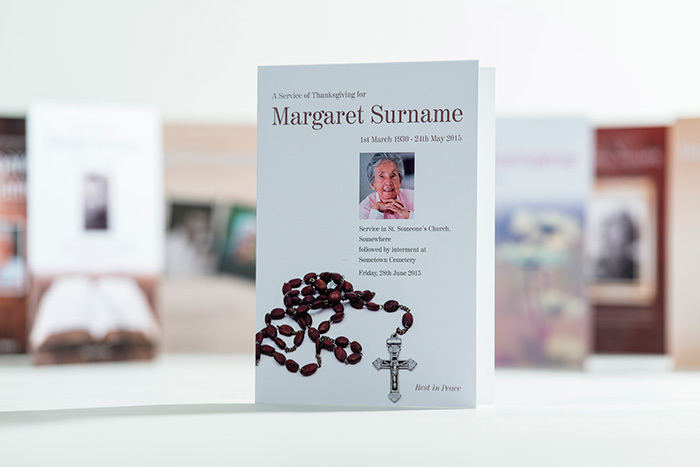 We will guide you through various options in ordering the service, the hymns, poems and readings you would like to include, and any photography you would like incorporated into the final design. There is a vast range of themed templates to choose from, covering a myriad of pastimes, hobbies and interests – sports and teams, music and instruments, and areas and landmarks, for example – further allowing you to tailor all aspects of the funeral to the life and tastes of your loved one.